Need some new breakfast ideas? Try this incredibly easy and delicious Salted Caramel Oatmeal – it’s gluten free, dairy free, and vegan! Hey friends, it’s time for Recipe Redux and another giveaway! I’ve been on a roll with the giveaways the past couple weeks, but what can I say, I like sharing 😉 P.S. I have more giveaways coming up in the next few weeks, too, so keep your eyes open for those. The February 2016 Recipe Redux theme is Break Out of Breakfast Boredom. That’s not too hard for me since I usually don’t get into a breakfast rut: I don’t typically eat the same meals for breakfast each day. It’s always changing! Some mornings I have oatmeal, other times it’s dinner leftovers from the night before, some days it’s homemade protein bites and fruit, or Hemp Protein Pancakes if I have batch-cooked them on Sundays. Due to my allergies, there isn’t anything typical about my breakfast, and I usually don’t eat the same thing every day. No eggs and toast for me, although I really do miss eggs! 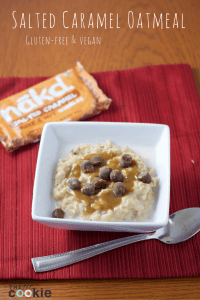 Since I have oatmeal once or twice a week, I thought it would be fun to change up my typical blueberry oatmeal and make it a bit more fun with some of my favorite healthy snacks: Nakd Nibbles! I hosted a giveaway for them before, but I wanted to create a recipe with the Nibbles this time, and Salted Caramel is my favorite Nibbles flavor! This Salted Caramel Oatmeal is a fun way to switch up your regular oatmeal and make your breakfast a little more decadent! If you’re wanting more protein, just add a few Tablespoons of your favorite vanilla protein powder to the oatmeal. Need some new breakfast ideas? Try this incredibly easy and delicious Salted Caramel Oatmeal - it's gluten free, dairy free, and vegan! 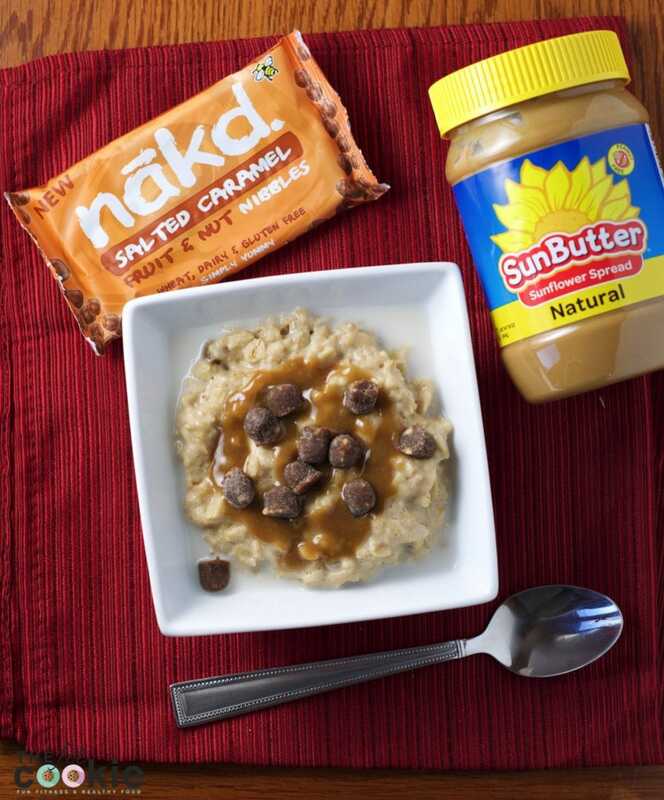 Salted caramel oatmeal? Yes, please. They all sound delicious, but I’d dive right into the toffee first! I want to try these so bad!! I’d like to try the Salted Caramel Nibbles! Salted caramel yeahhhh! Just love it! Just read your post – love it! Strawberries and Cream for me! That’s my second favorite flavor of Nibbles! I would love to try the toffee treats. I’d like to try the coconut bliss. Toffee treat sounds REALLY good, and this oatmeal sounds just as yummy! All the flavors look delicious but I would say the first one I’d want to try is Salted Caramel! Next up would be Toffee Treat. I’d try the salted caramel nibbles. Thanks for hosting! As delicious as this oatmeal sounds with the salted caramel, I can never pass up coconut, so Coconut Bliss it is! How fun! And the salted caramel nibbles are the best! I love salted caramel flavor. I am a sucker for toffee and I miss it since going Dairy Free. That is tops on my list to try. That caramel sauce is my favorite – so easy to make! Eat Nakd Strawberries & Cream Nibbles sounds heavenly! Thank you so much! I cannot decide between coconut bliss and salted caramel! Coconut bliss sounds good to me. Coconut bliss sounds blissfully delicious! I’d love to try Eat Nakd Strawberries & Cream Nibbles. 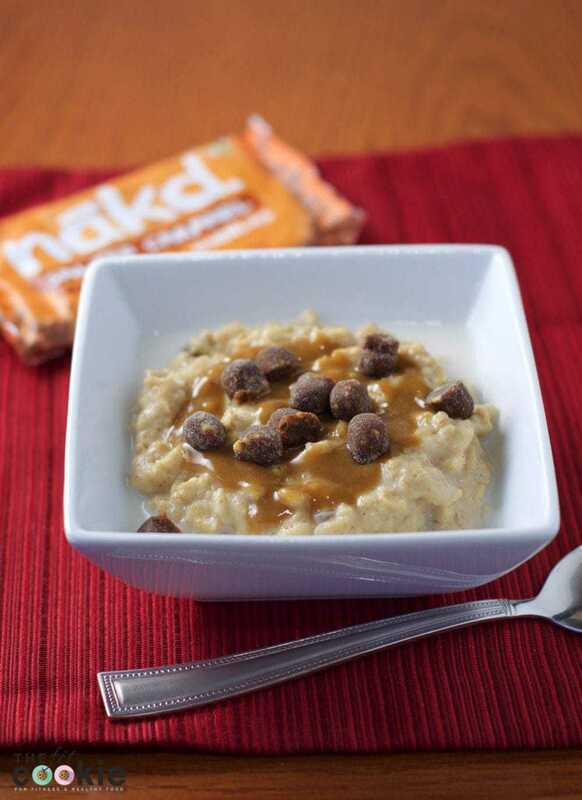 Salted caramel and breakfast in the same sentence. 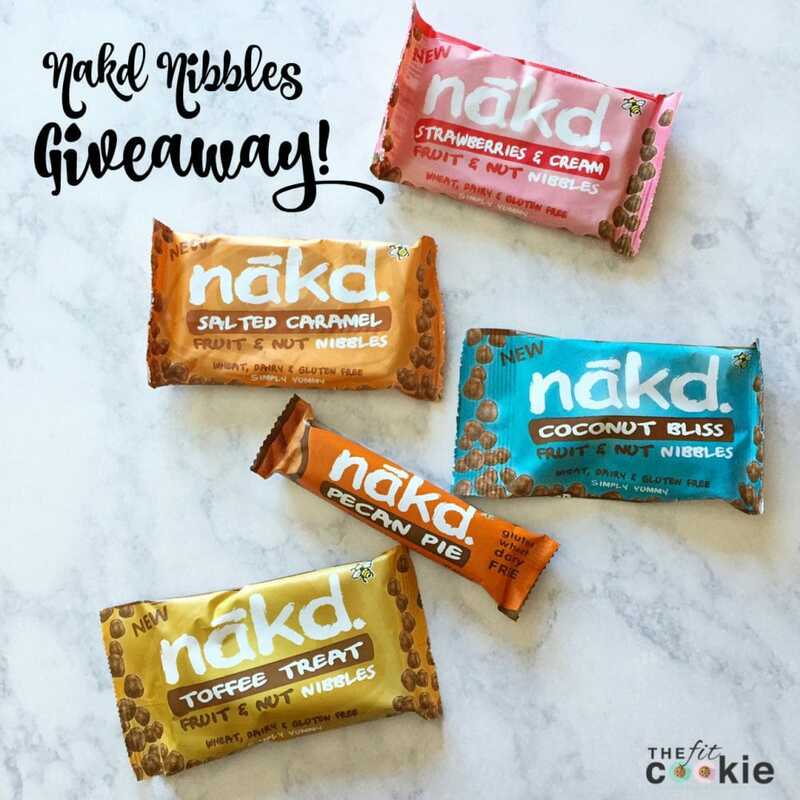 Sign me up 🙂 Loving these nakd bars, I’ve been wanting to try them! Pecan pie sounds heavenly! I want the toffee treat. The Nakd bars are awesome and anything salted caramel is amazing! I would love to try either Toffee Treat or Coconut Bliss. I’d love to try the strawberries and cream nibbles! That breakfast looks amazing! I think I would choose the coconut bliss. I love Nakd bars 🙂 so can’t wait to try them all! This oatmeal look like the bomb.com! I love salted caramel flavor, especially in a breakfast recipe! Salted Caramel pleeeeeease!!! Thanks for the chance! Salted Caramel for me, please!! Wow, this looks delicious and I always love gearing about new products! Hum…tough choice. I’d say it’s between salted caramel or Strawberrues & Cream ? Oooooooh! I love the nibbles! Just had the strawberries and cream this morning. But toffee is definitely my fave!! !